I put together a list of fruits and their fructose content, in relation to their overall carbs content (carbs usually being glucose). The idea here is that healthy fruits should (a) minimise fructose, and (b) minimise sugars overall. There is a bit of a controversy going on about fruits vs vegetables (or rather, whether fruits are “almost” vegetables), and also about which fruits are better than others. Clearly the question is rather complex, but certainly one aspect of it is the fructose content, where less is better – Mother Jones suggests to restrict overall fructose to 50g/day, and not all in one session because of the strain the fructose puts on the liver (see reference here). As an aside, there is a UK froyo company who appears to rather outrageously claim that their product is super-healthy, one argument being that it does not use sugar but agave syrup which seems to be 90% fructose – compare that to high-fructose corn syrup at 60%ish fructose and I guess you can figure out for yourself what is worse… details here. Finally, this is also important when considering whether or not to drink fruit juices. Some people seem to believe that they are alright, especially if freshly squeezed – I have to admit I was in this camp not long ago. Now firstly, freshly squeezed, with loads of pulp left is of course better than filtered and from concentrate – no doubt about it. Arguably drinking the equivalent of one orange (apple, whatever …) in the form of orange juice is almost equivalent to eating the fruit. So there is nothing wrong with a juice as dessert or snack. But of course this is not what usually happens – if juice is used as a thirst quencher one gulps down maybe 1/2l of juice in a few minutes. So in this context one might as well go for a Coke rather than kidding oneself of being health conscious. Otherwise if thirsty, drink water. This entry was posted in Nutrition, Paleo, Paleo 2.0 by Thor Falk. Bookmark the permalink. Wow! Great work. I’m going to grab a pomelo tomorrow morning. Probably sweeter than a grapefruit but those numbers are encouraging. Grapefruits are pomelos crossed with oranges… Pomelos would most likely be closer to the “good” corner. I love them, but can’t get them where I live. Enjoy! Nice work! Love the graph. It’d also be interesting to see fructose (major toxin in fruit) plotted against potassium (perhaps the most important nutrient in fruit). Nice! That would be another sweet comparison. where do I get the potassium data? any good tables for that? 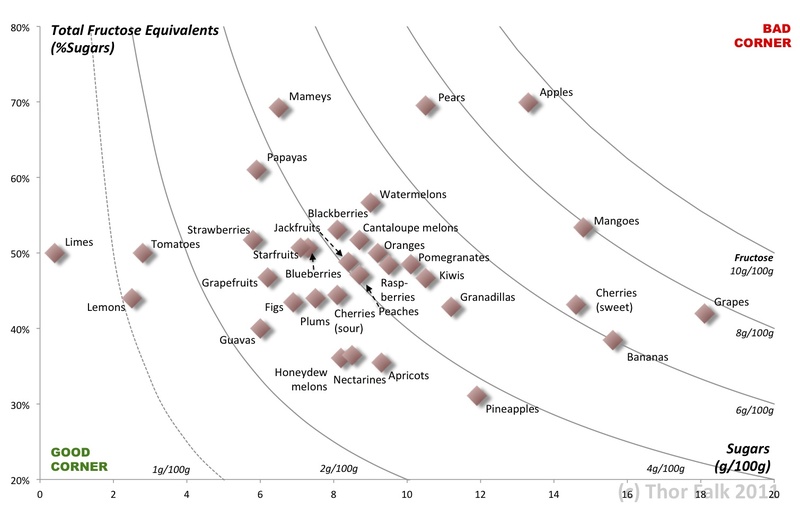 And fructose plotted against vit. C.
This is so incredibly useful. My daughter and I have fructose malabsorption. It’s great to see a concise list like this of the fruits that will be better in moderation. Thank you so much! Thanks so much for this! I’m on a low-fructose diet at the moment (Lentzners Junk Free January), and slaving my way thought the fructose content of various fruits. You just saved me 10 hours of work! I love you! Would be interested to see juice and soda on the chart just for comparison. Unfortunate to see no reference for the numbers presented. What really is the fructose content of a fruit? It must be relative to ripeness and much more. Pectin content? How can apples have so much pectin and so much fructose? The numbers just don’t add up and it makes me feel part of a herd moving blindly. We need references and the references need explanations how they got their numbers. The total fructose content is obtainable by multiplying the TFE and the sugars, for example for apples 70% of 13.3g is 9.3g. Specific fructose content is given in the table. A further source is provided. In the apples example, 9.3g is the figure cited in the link for Total Metabolised Fructose. If I have read it right, this total accounts for the existing fructose plus that fructose obtained by the metabolism of sucrose into fructose and glucose. I don’t see avocado on the list?